I'm back home in Bangkok and after months away, am getting into the swing of things by eating Bangkok-style food. Lunch a few days ago was yen ta fo and more recently, phat Thai. 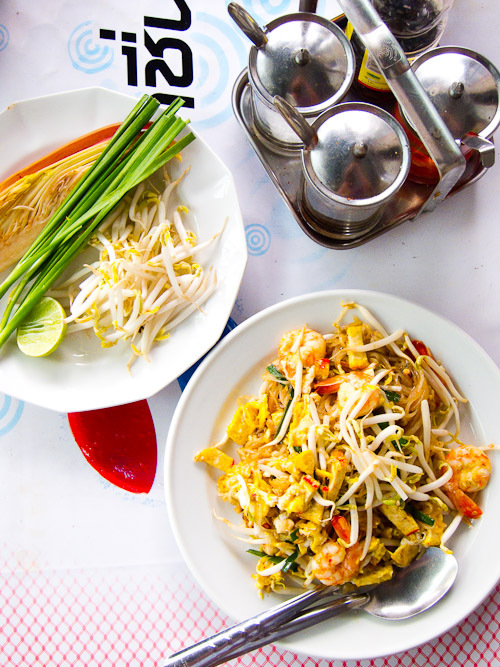 For many people outside of Thailand, particularly those in the US, phat Thai is synonymous with Thai food. And in what must be some Americans' fantasy perception of Thailand, I live literally next door to a phat Thai restaurant. Unfortunately this isn't my own fantasy scenario -- I'd much rather live next door to a khao khluk kapi restaurant -- but the phat Thai at this no-name shop near Th Silom is better than most. The noodles are slightly undercooked, as they should be, the dish is relatively well-seasoned with lots of egg and tofu, and comes served with good quality sides. My only gripe would be with the immense serving size, which if you ask me, is practically American.